Solar panels are very beneficial when you’re trying to reduce your energy bill. Of course, they also help you create a “greener” environment. These are only a few of the reasons why they’re growing in popularity with each passing year. As this happens, their prices continue to drop – over 60% since 2010. In fact, more than 1,508,000 solar panel systems are in existence throughout the U.S. today saving people over $30K depending on how much their state charges for electricity, the panels themselves, and their system’s size. However, it’s important to note that owning a solar panel system doesn’t mean you’ve fully maximized your energy savings to its greatest potential. You can still get more out of it if you’re willing to do things like install LED lighting. This is the most energy-efficient type of lighting that’s available today, consuming 80% less power than incandescent or HID bulbs, 75% less power than halogen bulbs, and 20% less than CFL (compact fluorescent) bulbs. When you replace less efficient lighting sources with these bulbs you reduce the amount of energy your solar panels must produce so they can create this power for use by other things. Typically, 250-watt panels can produce 30 kilowatt-hours (kWh) of energy in a single month if they get 4 hours of usable sunlight each day, which is what most systems do get in the United States today. However, if you’re like the average U.S. residential utility customer, you probably consume about 901 kWh per month. Here you can see that you can’t depend on the panels to produce 100% of the power your home or business requires either because you don’t have enough panels installed or the panels are incapable of providing you with enough wattage. Regardless of the reason, you must depend on traditional electricity for the remainder of the electricity that you need. This is why it’s so important for you to make sure that you have installed lights that don’t require too much power so your panels don’t run out too fast. Of course, this is also something that will help save you money. With LED lighting installed you can maximize your savings since they don’t drain as much energy from your panels. It’s also worthy of noting that they’ll last longer – over 50,000 hours, which is about 3 times longer than HID bulbs, 5 times longer than CFL bulbs, 13 times longer than halogen bulbs, and 42 times longer than incandescent bulbs. Clearly, you can save on replacing bulbs and conducting other types of maintenance here. Besides saving you money, solar panels also help reduce greenhouse gas emissions since they consume less power than other types of lighting. This means that your panels aren’t drained of their energy nearly as quickly so you won’t need to use as much of your traditional power source as you have in the past. For instance, with a 5,000-watt system you can eliminate as much as 4.7 tons of carbon dioxide (what would be needed when using traditional power – as much as one vehicle emits over the course of a single year). It’ll also benefit you to unplug any electronics you aren’t using, turn off lights when you’re not in a room, and opt for more efficient electronics. All these things will work together to greatly reduce your energy bill. 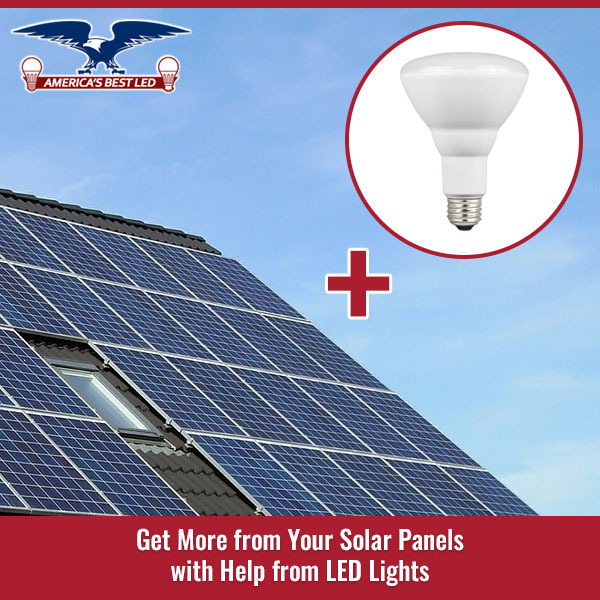 Whether you’re interested in adding solar panels to your home, converting to LED lighting, or both, you’re bound to have some questions and need some help. For this you should contact America’s Best LED. Over the years they’ve been successful in helping many people. You should be next.